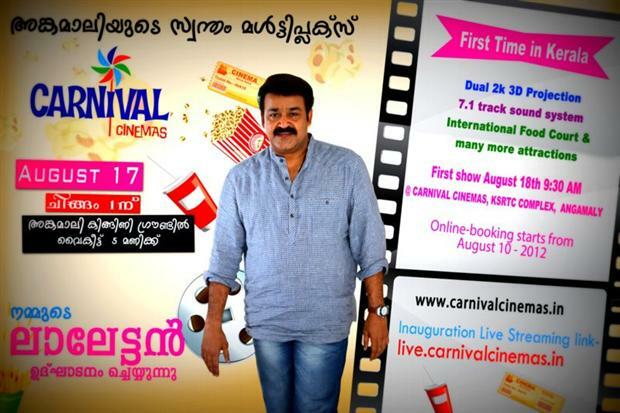 Carnival cinemas, Angamaly's first multiplex inaugural function to be held on 17th August 2012 at KSRTC Complex. Kerala's First 7.1 Sound track with Dual 2K projection System is going to be inaugurated by Mohanlal at Angamaly KSRTC Complex. Carnival Cinemas, Angamaly's first Muliplex theatre on the 5th Floor of KSRTC Complex is full set with 3 screens. Angamaly is getting a new face by the introduction of this multiplex. Online booking starts from 10th August 2012. First show is on 18th August 2012, 9:30 am. Carnival cinemas opens its door to all film lovers in Angamaly. International food court and many more attractions are awaiting for you. Vinod, which was the last theatre in Angamaly, was closed recently because of financial crisis. Near by theatres are in Perumbavoor, Chalakkudy and Aluva. It is expected that new 'Onam-release movies' in this multiplex will attract hundreds of people. 0 Response to "Carnival Cinemas Angamaly to be inaugurated on 17th August 2012"